Do you always feel like you’re unprepared when tax season rolls around? If so, read on to learn how to organize your tax documents beforehand. Almost 75% of Americans name finances as their biggest stress. During tax season many households are uncertain about the filing process. People are afraid of filing incorrectly and getting in trouble with the government. The fear is a valid one considering that if you make a mistake on your Federal tax return, the IRS will charge you a penalty of at least $210. One of the best ways to overcome tax related anxiety is to take action towards your goal. 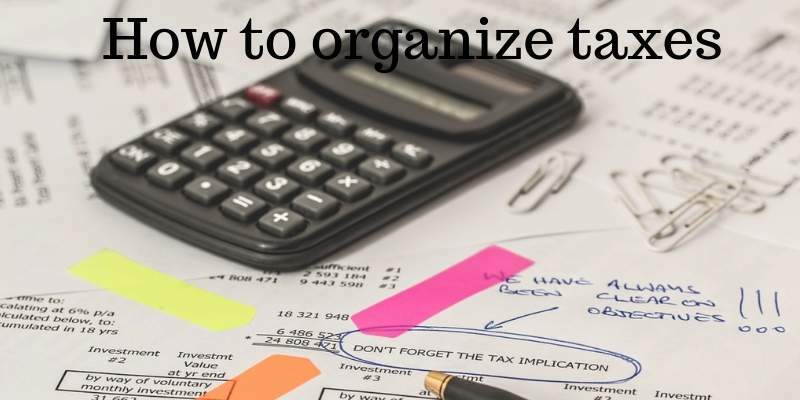 Read on to learn how you can start organizing your tax documents today. Tax season starts on January 1st and will end on April 15th. If you’re unable to file by the April 15th deadline you’ll have to file for an extension. During the three and a half month period, you have to prepare all of your financial documents and receipts. Your goal will be to account for all of your taxable earnings during the previous year. Your employer will be providing you with specific tax documents. The information on the documents will be part of your individual tax return. A lot of people choose to file their own taxes while others hire a professional agency. Professional accountants will work with a variety of software to get you the best return. The 2018 Professional Tax Software Comparison Chart helps break down different options for software your tax preparer might use. The IRS requires anyone who makes $10,000 or more to file for taxes. The $10,000 is the gross income required to pay federal tax. Next, we’ll break down some of the different tax forms you might receive. Your individual living and working situation affects the tax forms they receive. If you don’t receive the documents you need, you’ll need to send in a request. If it’s an employer you may be able to simply call and ask for them to send your forms over. Never delay in filing your taxes because a third party is failing to supply you with the necessary forms. There are always actions you (or your accountant) can take to help you meet the submission deadline. Next, we’ll describe each form individually to help you decide what one works best for you. The 1040 form is a basic income tax document to report your individual income. Another name for 1040 is the “long form”. The nickname comes from how thorough and extensive the questions are on 1040. One benefit of using the long form is the ability to claim more deductions. You’ll also be able to claim any tax credits that apply to your living situation. The 1040 form provides you with the most opportunities to lower your tax bill. The 1040A is a short form of the standard 1040. You can still claim different deductions, but they have to fall under standard categories. NO matter what age you are you can file using the 1040A. Keep in mind however that you will have a limit to the number of itemized deductions you can list. The good news is you’ll be able to prepare your taxes much faster using the short form. Also, the IRS will be more likely to give you a fast and speedy tax return. The 1040 EZ is even shorter than the 1040A form. If you are single or filing jointly without dependents, you can use the 1040EZ. The form is very easy to understand and won’t take you long to complete. If you’re a non-resident alien you’ll need the 1040NR form. This form is long and extensive similar to the standard 1040. If you’re a resident now but were a nonresident the past year, you still need the 1040 NR. Begin to write out all of the different categories that apply to your life. You’ll find as you write down different expenses, you can group some of them together. For example, business clothing receipts and business dinner receipts can go into one group. Both business expenses would fall under the “evidence for deductions” category. Make a habit of dealing with your receipts on a weekly basis. If you let all of your receipts pile up, the organization process can be overwhelming. If you already have piles of receipts, start to organize them a little bit every day. You may not have to file all of your old receipts. Instead, start to determine what receipts matter and what ones you can throw away. Holding onto every receipt in the name of “I might need it” can hinder your organization efforts. To determine what receipts are garbage, reference your categories. If a receipt doesn’t fit under one of your pre-established categories, you don’t need to keep it. You’ll find you end up throwing away more receipts than your file. Give yourself plenty of time by setting aside a chunk of time every day to go through old receipts. Place all of your minor receipts in an envelope you can easily access. Then when you go through your old receipts, you can include a sorting of the current ones. Remember if the current minor receipt doesn’t fit into a category you can discard it. The larger the expense, the more important the receipt is. You might consider investing in a receipt scanner. You can then scan the large purchase receipts and store them on a hard drive. Next, you can create a personalized filing system to store every financial document. We recommend you try using a 3 folder system to keep things simple. The folders represent broad categories for you to store your financial documents. However, keep in mind you’ll often need more than 3 physical folders. In your first folder, you’ll place all of your income information. Keep a list of all of your different income sources and the amounts they generate. Your 1st folder will be where you keep the list and update it whenever you receive new income. If you get a second job or win a contest, you would document the income in your 1st folder. You should also keep track of any income you earn from things like interest, dividends, and distributions. The second folder will be for all of your expenses and deductions. You can save you’ve approved receipts here along with your other deductions. The more deductions and expenses you have the more you’ll need additional folders. Keep track of all your investment activities by storing the appropriate documents. You’ll want to keep proofs of purchases, trade confirmations, and annual statements. Subfolders can have titles that have the category number they relate to and their specific purpose. For example, if you donate a lot to charity you might need a charity subfolder. You could still file the folder under the 2nd category, and you could label it “2nd Folder Charity”. Then if you have a lot of medical bills they could say, “2nd Folder Medical Bills”. Take the stress out of your tax documents and finances. Are you looking for ways to make more money online? SheKnows Finance is a personal finance blog and we want to help you improve your income. Our goal is to provide you with helpful and relevant information for making money online. If you want to earn a full-time income online, or just make extra cash, we can help! Our articles cover different sources for online income, with topics about cryptocurrency, sweepstakes, cashback sites, survey sites and more. If you like free things, check out our latest article about online freebies.